NETWORK UPDATE: The only change from this morning’s numbers was a 0.1 bump for NCIS: NEW ORLEANS. Bravo was at the top of Tuesday cable with REAL HOUSEWIVES OF BEVERLY HILLS, down 0.05 to 0.89. It was followed by REAL HOUSEWIVES OF NEW YORK at 0.60 and NEWLYWEDS, down 0.03 to 0.23. 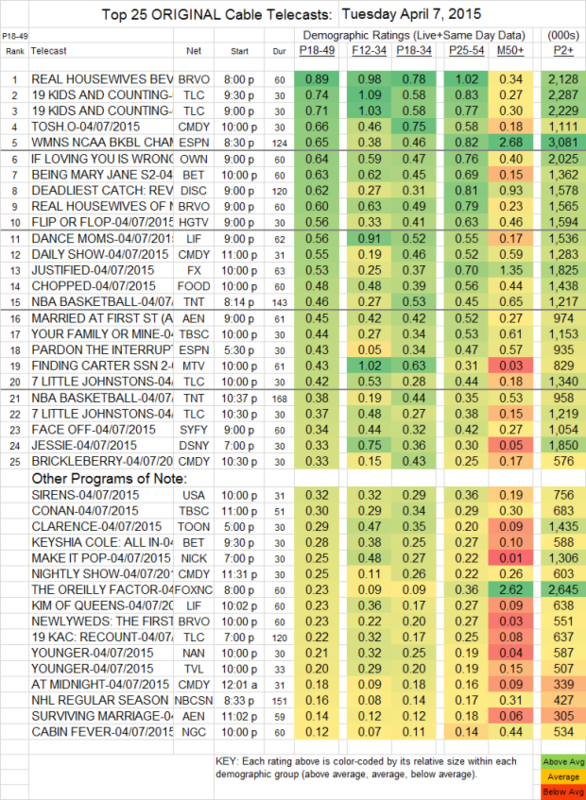 TLC’s 19 KIDS AND COUNTING, at 0.74/0.71, was far below last week’s 1.24 wedding episode, and 7 LITTLE JOHNSTONS, at 0.42/0.37, was correspondingly off about two-tenths from last week’s 0.60, while the night’s lead-in 19 KIDS AND COUNTING RECOUNT was down 0.13 to 0.22. TOSH.0 (Comedy central) was off a tick to 0.66, and BRICKLEBERRY fell off by 0.05 to 0.33. The WOMEN’S NCAA CHAMPIONSHIP GAME on ESPN scored 0.65, with an impressive 2.68 rating in the Men 50+ demo, and well ahead of TNT’s NBA game at 0.46. OWN’s IF LOVING YOU IS WRONG dropped 0.07 to 0.64. BEING MARY JANE (BET) fell 0.14 to 0.63, and KEYSHIA COLE was down 0.06 to 0.28. On Discovery, DEADLIEST CATCH was at 0.62. Lifetime’s DANCE MOMS fell 0.08 to 0.56, and KIM OF QUEENS was at 0.23. JUSTIFIED (FX) slipped 0.03 to 0.53. YOUR FAMILY OR MINE premiered on TBS at 0.44. FINDING CARTER (MTV) fell 0.09 from last week’s season premiere to 0.43, and it was down 0.43 in the F12-34 demo to 1.02. SIRENS (USA) rose 0.07 to 0.32. YOUNGER continued to have an unconventional airing pattern, with simultaneous runs on TV Land and Nick At Nite (unlike last week, it doesn’t appear to have also aired on Nick Jr). Compared to last week’s 10PM episode, it was respectively up 0.03 to 0.20 (essentially holding even in total viewers) and up 0.05 to 0.21 (down about 75K total viewers, but steady with the total viewership of last week’s 10:30PM episode).